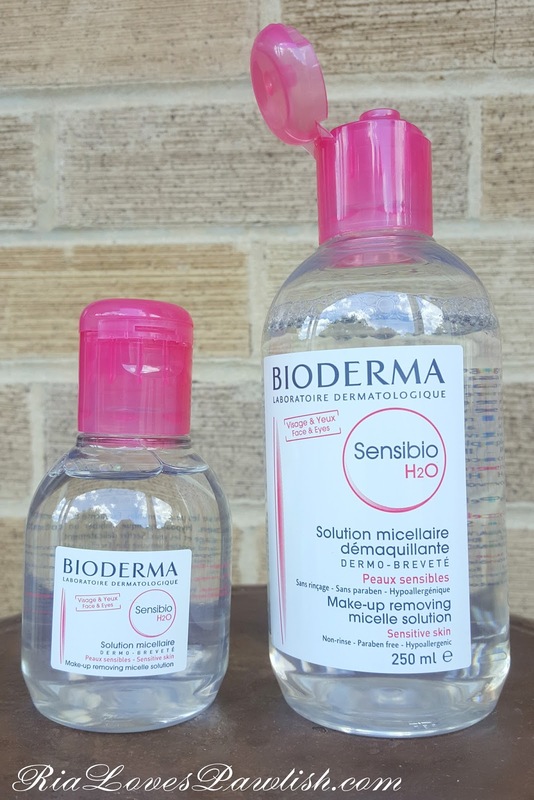 today i have Bioderma Micellar Water Sensibio H2O to share! (press sample, kindly provided to me for review). this product is the original micellar product that i've been hearing about for years, but wasn't available in the US... so, i was really excited to give it a go when i was offered the opportunity! frankly, i wasn't really expecting to like this product. having tried out the US drugstore answer to this, which did not work at all for me, i figured Bioderma would be the same. WRONG! i now get why all the other countries rave about it! i saturate two cotton rounds with with the product, then leave it pressed against my eyes for a bit. i usually half open my eyes to get the undersides of my top lashes and the bottom lashes as well. once i feel i've done both the tops and bottoms of my lashes (i have no specific amount of time... probably 15-30 seconds) i simply wipe the eye make up away! it is SO easy and works exactly as it proclaims to. the more layers of mascara you have on, the more swipes you will have to take... or, just let the product sit on it a bit longer before wiping away! i have not tried it with waterproof mascara as i don't use it, sorry i don't have an opinion on that for those of you who do. after using the cotton rounds to remove the eye makeup, i then flip them over and wipe them over my whole face to remove face makeup. it doesn't usually get it all, but it makes it much easier when i use makeup removing wipe! the scent is not strong at all, and i have used it with my contacts in with no issues. if you get a lot in your eyes it can burn a little, but flushing them with water makes it go away! in the US, you can purchase Bioderma Micellar Water Sensibio H2O at Beautylish.com... THIS is the direct link to their Bioderma page that has loads of other products by the brand as well. the 100ml retails for $6.90, the 250ml for $11.90!